Twelve government advisers—many of them said to be allies of KNUP leader Nhek Bun Chhay—have been stripped of their positions in a suspected purge of officials loyal to the former general. Nhek Kim Chhun, Mr. Bun Chhay’s older brother, and Kuch Moly, a former deputy governor of Oddar Meanchey province, were among those who lost their positions, according to a royal decree signed by the king on Saturday. 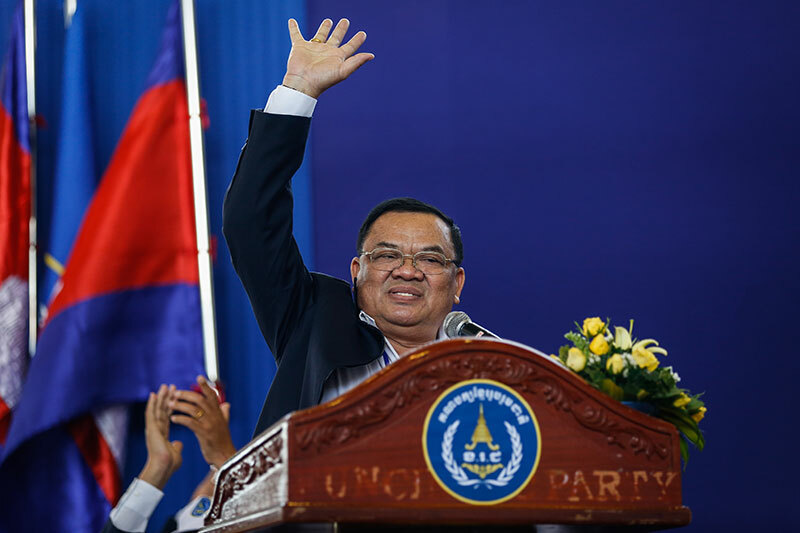 All three are former members of Funcinpec, a royalist party that was the CPP’s biggest rival during the first decade of Cambodia’s current democratic regime, which held its first election in 1993. Mr. Bun Chhay broke away from Funcinpec to create his own party, the Khmer National Unity Party, known as KNUP, early last year. Of the 12 sacked advisers, three—including Mr. KimChhun and Mr. Moly—had a position considered equivalent in rank to a government minister; three had a role equivalent to secretary of state, and the remaining six were comparable to undersecretaries of state. Lu Lay Sreng, a former senior Funcinpec politician, recognized several of the names on the list as people close to Mr. Bun Chhay, who was himself stripped of a government adviser role last month. “If the boss is gone, his subordinates must follow,” Mr. Lay Sreng said. The adviser roles had only been granted to the group because Prime Minister Hun Sen “tolerated Nhek Bun Chhay,” he added. Earlier this week, Mr. Lay Sreng was chastised by Mr. Hun Sen for suggesting a law that would guarantee immunity for former prime ministers, a proposal the premier took as a prediction of his possible defeat in upcoming elections. At the KNUP’s headquarters in Phnom Penh yesterday, an official confirmed some names on the list as close allies of Mr. Bun Chhay, but declined to comment. No one answered the door at Mr. Bun Chhay’s house, while other KNUP officials could not be reached for comment. Mr. Bun Chhay lost his position as government adviser shortly after the June 4 commune elections, when the KNUP was the only minority party to win a commune chief seat. Mr. Bun Chhay was also said to have been recorded talking on the telephone to CNRP lawmaker Eng Chhay Eang and pledging his support for the main opposition party. Mr. Chhay Eang, a CNRP vice president, said he had no idea if he had anything to do with Mr. Bun Chhay’s downfall in the eyes of the government. Government spokesman Phay Siphan said he did not know whether the sacked advisers were close to Mr. Bun Chhay and would only say that the stripping of their positions was administrative work. As a military general for Funcinpec during a time the party and the CPP shared power in the mid-1990s, Mr. Bun Chhay retained a strong following in parts of the country. Political analyst Meas Nee said he could only speculate on why the CPP appeared to be flushing the government of Mr. Bun Chhay’s loyalists, but perhaps it was to provoke the former general as well as the soldiers in the armed forces who still support him. Nevertheless, he said the situation was an important one to closely monitor as a potential spark that could lead to a situation similar to that in Thailand—where the army rules with sweeping powers—or Cambodia, when a brief armed clash between forces loyal to the CPP and Funcinpec in 1997 led to a swift victory for the premier and his prolonged consolidation of power. With the ruling CPP’s popular support eroding ahead of next year’s national election—the party lost hundreds of seats at last month’s local elections—Mr. Hun Sen has warned of impending war and the potential elimination of hundreds of opponents in order to preserve the country’s peace under his rule.